Did you know that the Space Shuttle carries a load of mementos? Read all about it click here. The Rassvet has been installed, how about a $200 million dollar addition (the size of a small Winnebago)? Christian Science Monitor featured a great article explaining the Research Module yesterday (read it here.) While you are there check out this fantastic series of International Space Station photos (click here) --we love photos of the astronauts with long hair! 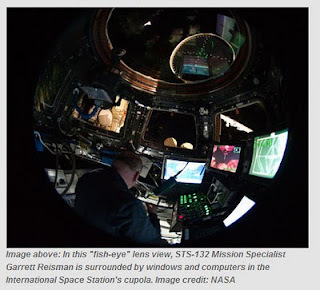 For more day-to-day on the International Space Station, read this Spaceflight Now article (click here) including timelines and tons of video. Did you know that one of our Books for Walls Project 'goals' is to learn about life on the International Space Station --in particular we want to know if they can bring books up there and do they have a library? And we'd love to know what they are reading. If you know any astronauts or space buffs --share the project help us learn! and best of all tell them to come right here: www.booksforwallsproject.org. Mom and I are watching really funny videos about the astronauts --like spitting water and doing flips. Did you know that SPACE has a smell? We just learned from the STS-132 videos --the astronauts say it has an "ozone/electrical smell" one joked that it smells like chicken! Thank you for keeping us posted! Those photos are amazing. I can't wait to share them with my kids tonight! Back in the 80's and 90's it seemed like we as a country paid much more attention to every launch/mission. I am so glad that you are focusing on astronauts and sharing your exploration of the mission with us. A book on the ISS (international Space Station)! While watching clips we learned that there are books --well, a kind of book, we'll post a photo tomorrow. And we learned how Garrett Reismann feels before going on a space walk we'll post that tomorrow as well!